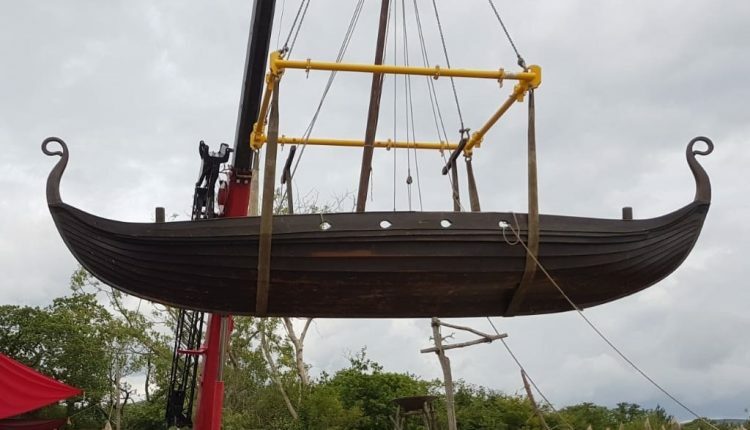 A modular spreader frame comprising Modulift beams is being used to lift handcrafted boats during filming of the History Channel’s “Vikings” historical drama series in Co. Wicklow, Ireland. The elaborate set was created at Ashford Studios and is being shot in collaboration with Irish National Marine Services. The CMOD 24 frame is being utilised beneath the hook of a 50t capacity Grove GMK 3050 mobile crane, supplied by crane sales company Irlequip Ltd., which is also a distributor of Modulift’s range of lifting and spreader beams. Supplied from Irlequip’s Modulift stock, the frame with a 5m by 4m maximum span allows it to lift all vessel types on set. These boats vary in dimension and weigh up to 5,000kg. The frame, recommended for loads that have more than two lifting points, is capable of lifting up to 30t depending on configuration; the corner units are rated at 7.5t each. The majority of lifts on this project have seen the frame employed at 4m by 3m, but the larger span has also been used for the biggest of the boats. The CMOD modular spreader frame is designed to expand the capabilities of Modulift’s modular spreader beam system. The struts from the beams are combined with four corner units to complete the frame. Those already in possession of Modulift struts can reuse them with the corner units to achieve four-point lifts. Maher explained that the CMOD 24 is the smallest frame that facilitates a length of 5m. Irlequip were consulted on the additional rigging gear and recommended the correct slings and shackles required, allowing the user to source the equipment from their regular supplier. Maher and the team remain in regular contact with the crane operator, who was already part of the crew, and onsite riggers, as the project continues. In this case, a 50t mobile crane with a ‘power-boom’ was deemed the best solution allowing maximum flexibility where internal headroom was at a premium. Additionally, the hydraulic luffing jib proved invaluable for mounting lighting and allowed for the precise focus of light during certain shoots. The CMOD spreader frame is currently available from the CMOD 6 up to the CMOD 250. The systems lift up to 300t. © 2019 - Cranesy. All Rights Reserved.